Well the RACV Caravan Camping & Touring 2014 Show is over & we are now back in the Sunshine State. I am sure all that attended this huge event had a great time and from all accounts it was a huge success for all, both exhibitors & all guests. Personally I would like to congratulate the organizers for a brilliantly run show. Our stand was on the second floor of the main pavilion and a first for me to attend. Some may say a Virgin? I was lucky enough to have some very special friends join us for the ride. Keith & Christine drove all the way south from Hervey Bay with their Olympic caravan to firstly tag along for the caravan journey south and then help my wife Janelle and I man the stand and talk to the casts of thousands. It was a lot of fun, we had many laughs travelling on the buses, and trains and using the Victorian public transport system with ‘MYKI’ – Special thanks to Keith & Christine for their valuable assistance. Our journey south was as follows – We travelled on the first day from Redcliffe to Port Macquarie NSW & stayed the night at the Leisure Tourist Park. Second day we motored down through Sydney northern suburbs, across the M7 and then joined the Hume Highway. How great is this Highway? We managed a morning tea break at ‘Holbrook’ NSW where the submarine “HMAS OTWAY” is on display. This was a fascinating Maritime Submarine museum & we all enjoyed a nice cuppa, plus sweet treats from the local bakery. We drove on further south to Gundagai Tourist Park & enjoyed a restful nights sleep. On the third day we only travelled a short distance to Seymour just north of Melbourne. This overnight was at the Goulbourn River Tourist Park. It was a relief after the previous 2 days of long driving hours. The Top Tourist Parks we found to be very warm and inviting with their managers and staff, always full of advice and smiles. However we were in for a surprise coming into Melbourne with all the instructions given to me by the ever helpful Mal, the Fiveways Caravan Park owner/manager. My navigator wife felt uneasy about where he was leading us with his instructions on how to avoid the traffic lights and congestion of Melbourne. So we changed tack & followed the Garmin Sat Nav. Guess what?? We ended up going right through the centre of Melbourne, with massive traffic jams plus what seemed like hundreds of traffic lights! Not much fun when towing a 30 foot caravan! We eventually arrived at the Fiveways Caravan Park at Dingley Village but this was after an urgent SOS call to Mal asking for help! On arrival we all enjoyed many laughs & of course few XXXX beers and wine for the ladies. Being in the heart of ‘AFL Land’ we had to be careful not to mention the Broncos or the NRL!! LOL The six day caravan show was brilliant with the four of us having a great time, a new experience being first timers, plus meeting many Victorians, South Australians, a few Tasmanian’s, a few sand gropers, along with many New South Wales visitors. I can only say a huge thank you to all those that came to our stand, asking many questions & taking away our brochures on our various services. I feel the Holiday Relocation Services was up there with the most inquiries. Families that are still working with limited time for holidays welcomed this new service that we have created. For instance families wishing to travel to Perth to explore the areas south towards the Margaret River, instead of spending days travelling across the Nullabor (if you have children one has restraints with time travel & distance covered daily) so the option of having your RV delivered to Perth, sounds awesome to many. I meet you at the airport after your flight & you have all that time in the district you wish to see. Perfect solution! Several caravan & camper trailer owners also asked the question about doing the same but delivering their rigs to Darwin so they can spend their 3 weeks holiday in the areas like Kakadu and the Kimberley’s instead of spending days driving through the centre of Australia. Everyone thought it was a grand & simple idea! Send me an email when you want a quote to see if it is within your budget. 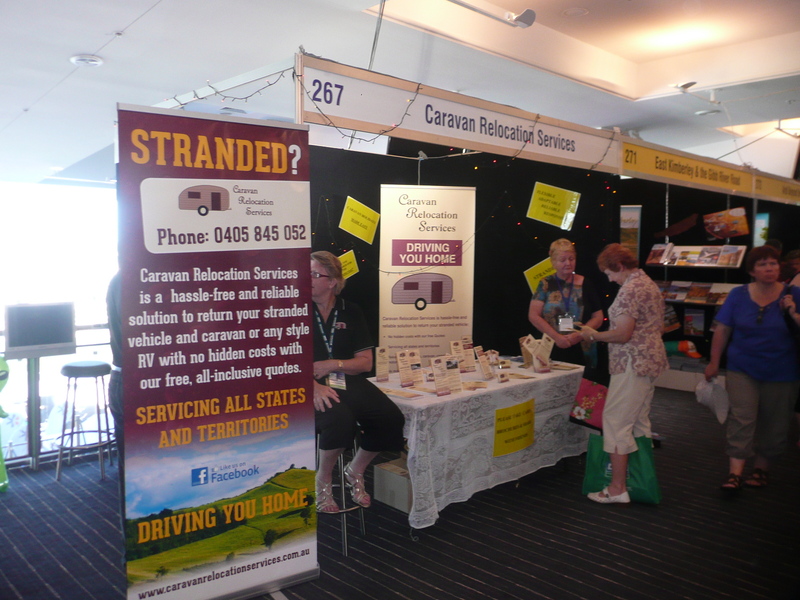 So that was it – the RACV Caravan and Camping Show for 2014. Next week I will cover our return journey north back home to sunny Queensland. Thank you for reading my blog. 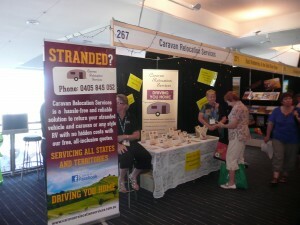 The picture below is our stand 267 at the RACV caravan show with a special friend of mine Anne Peters who drove down from Yarrawonga to help us out. Thank you so much Anne, you have been such a real treasure. Along with my other assistant Janelle my loving wife. The one phrase that did come out from the show with our ‘DRIVING YOU HOME’ theme mostly said by the females was – ” YOU NEVER KNOW” – how very true a statement! Those that have witnessed or been in similar situations are very aware of the stress this can cause. Travel safe and happy days to all.